At Meg and Bryan’s wedding in the Adirondacks of New York, it was particularly fun to photograph Bryan as he prepared. While he knew he wasn’t going to have as many eyes on him as would be fixed on Meg, Bryan wanted to make sure that he looked his best for his new wife. He took care with everything that went into getting ready, so as I photographed this process, I wanted to capture the feeling and the focus of this morning. 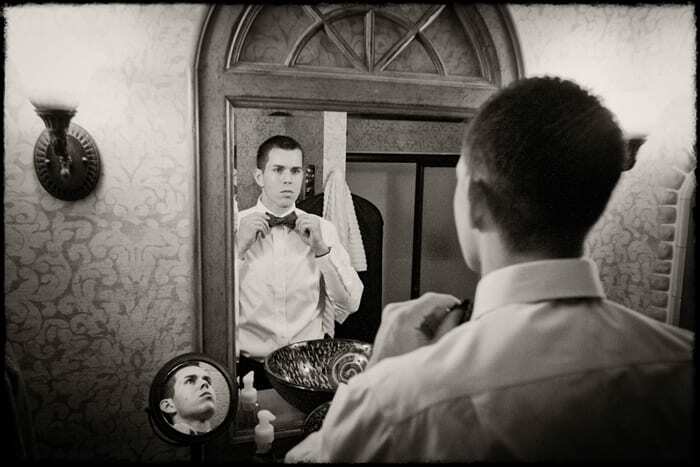 There are many ways to take a photograph of a man putting on a bow tie, but I wanted to make this image special. I had taken a few images through the door of the bathroom, trying to use the doorway as a frame. While succeeding at making a photograph with several layers, I wasn’t quite getting the feeling of the moment. I then quietly stepped into the bathroom and discovered the placement of the mirrors. The space was tight, but I placed myself in the perfect position to get Bryan’s face in both mirrors without compromising the integrity of the larger composition. Then I waited. I waited until his hands were in action and his face showed the focus he was putting into looking as sharp as possible. I clicked the shutter a couple of times and I knew I had the moment I was looking for. Craig Kompelien is an associate photograper with Rob Garland Photographers, a company which specializes in wedding photojournalism and fine art printing. Craig is an outstanding photographer with a heart for photographing people and capturing life in the moment.